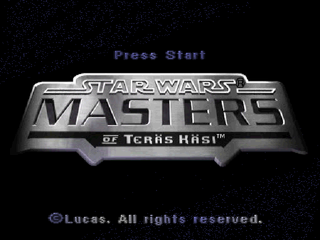 STORY: Masters of Teräs Käsi takes place between the Star Wars movies, Episode IV: A New Hope and Episode V: The Empire Strikes Back. The destruction of the Death Star at the hands of Luke Skywalker severely crippled the Galactic Empire. The Emperor wanted retaliation against him and all of the Rebel Alliance and sought the services of assassin, Arden Lyn, to eliminate the Alliance's key members. Luke and the others finds out about the Empire's plot and challenge Arden, face to face. 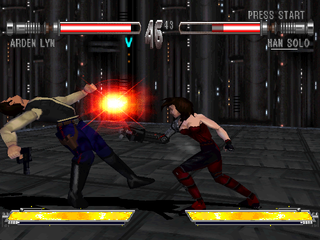 REVIEW: A Star Wars fighting game... now that's something with potential! 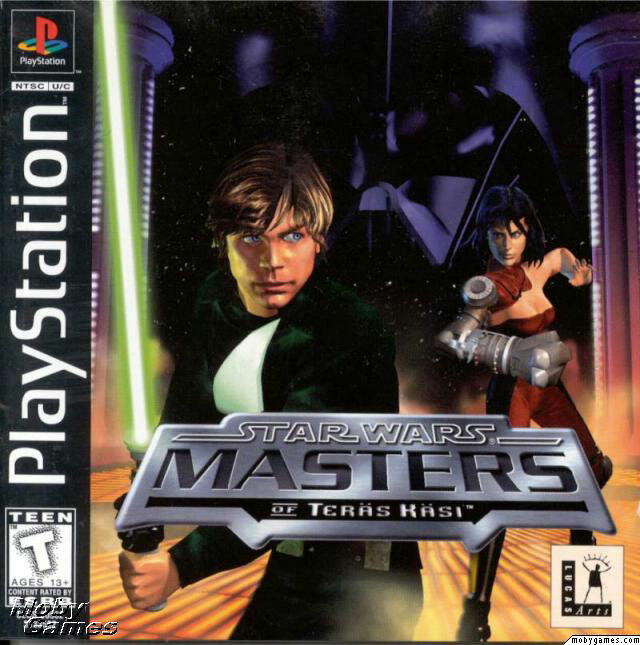 Unfortunately, the first (and only) Star Wars based fighting game didn't live up to the hype, and that's an understatement... it's pretty terrible actually. 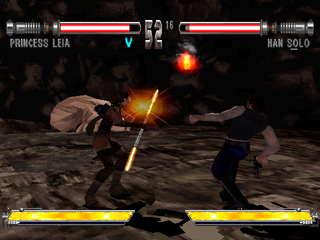 Teras Kasi features your typical fighting game modes: Arcade, Survival, Team, Practice and Versus. 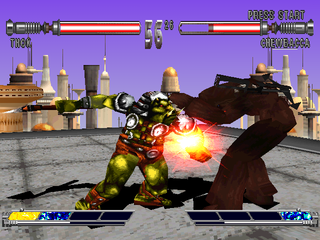 The fights take place on square arenas with ring-outs (definitely inspired by Soul Edge). 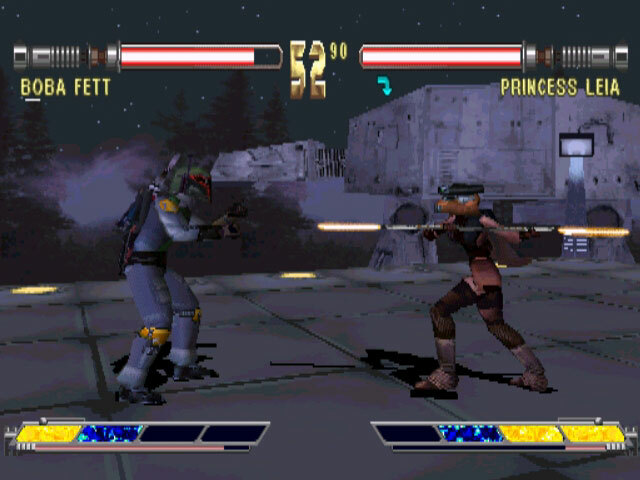 Each fighter starts off fighting bare handed, but has a weapon that they can draw and use (ranging from blasters to light sabers). It's actually an innovative concept in the fighting game genre, but it didn't get a chance to shine due to the stale gameplay engine. 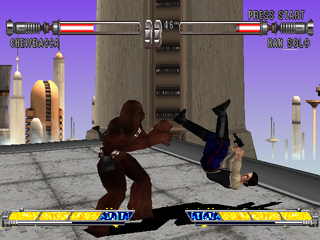 In a nutshell, the 3D gameplay is noticeably clunky and slow (even for a 3D fighter in 1997), but at least characters are able to sidestep, which adds something to the gameplay. Overall, the fighting mechanics seem to be an afterthought. 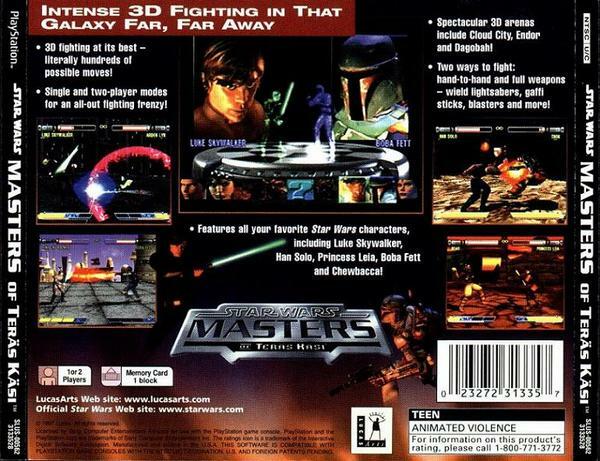 Basically, this is a really sloppy 3D fighting game engine with the STAR WARS logo slapped on the cover. 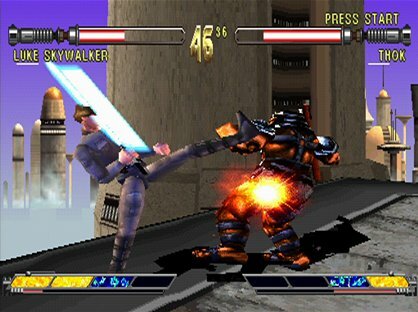 At the end of the day, the gameplay and controls are flat-out awful when compared to nearly any other fighting game out in 1997/1998. 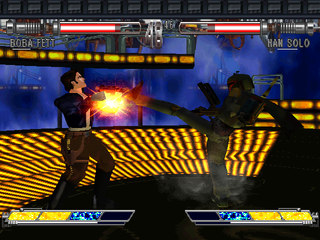 The graphics appear "rushed" and pale in comparison to many PS1 fighters of the era. The animation can also be summed up as "choppy" and too slow for its own good. The below average character models and shoddy textures don't help the look of the game either. One of the only positive aspects of Teras Kasi is that the character roster isn't bad... at least the roster is a halfway decent fan service for Star Wars fans. 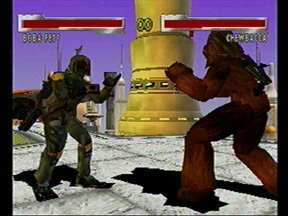 That said, unless you were one of those crazy Star Wars fanatics who went to every Star Wars movie launch dressed up as a fat Jedi, you probably won't enjoy playing this game very much (unless you're playing it simply for laughs). 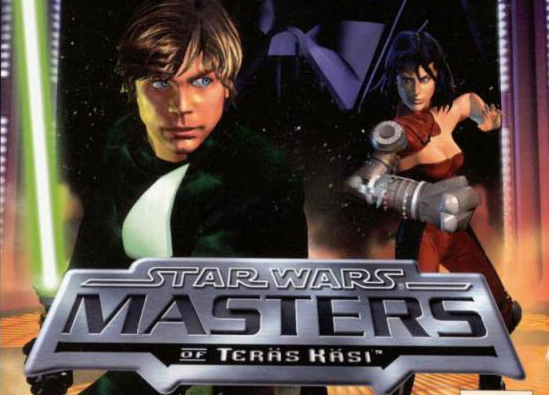 A Star Wars fighting game sounded great on paper, but unfortunately LucasArts's first and only attempt at a fighting game was laughable at best. Perhaps if LucasArts gave Capcom or Namco the rights to make this game, it probably would've turned out considerably better. 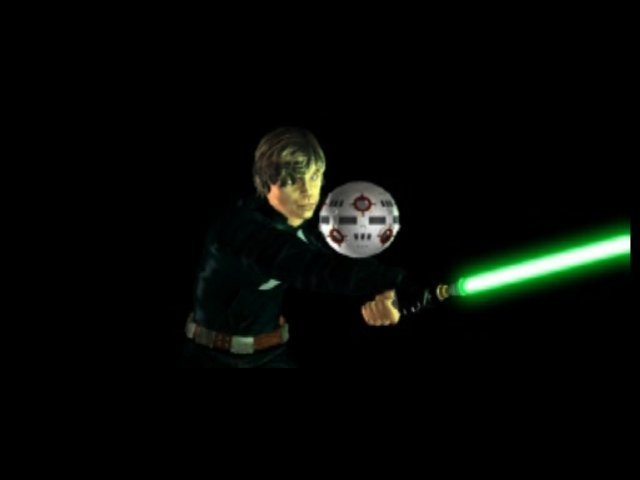 Ironically enough, in 2008, Namco obtained the rights to Darth Vader and Yoda and featured in Soul Calibur 4 as guest characters. 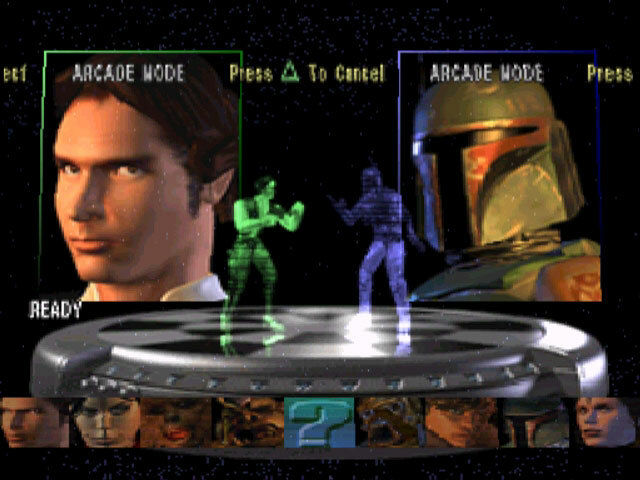 Needless to say, it was awesome to see some Star Wars icons looking as badass as they should in a proper fighting game.